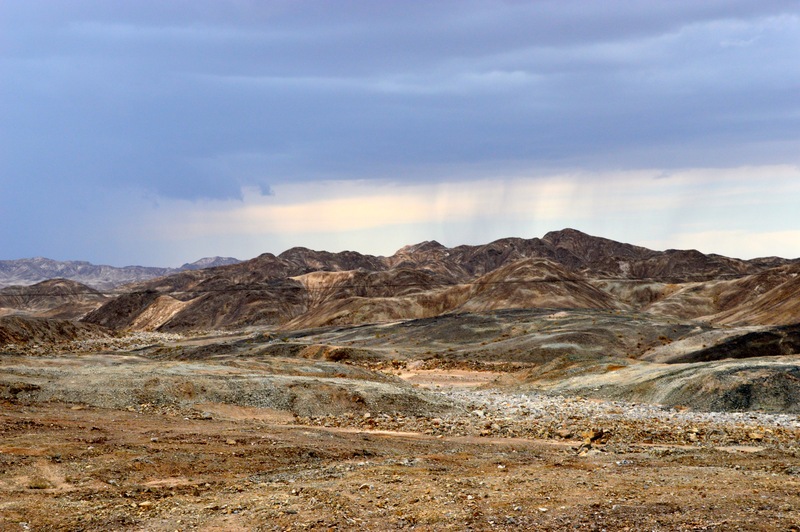 Xinjiang sits in the far west of China, a province dominated by desert, skirted by momentous mountains and filled with ancient tales of the silk road traders. 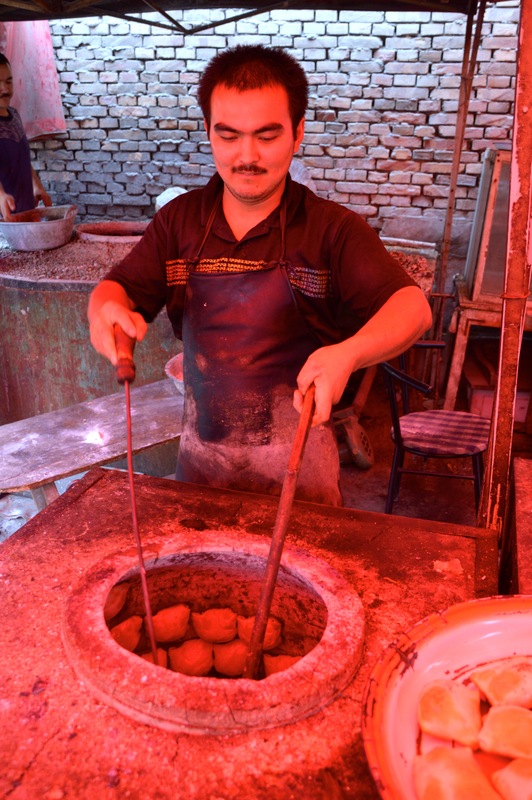 Culturally it is barely China at all, populated mainly by the Uyghur minority, a Turkic people from Central Asia. They look different from the Han Chinese, speak a different language, their food is different and most follow Islam. 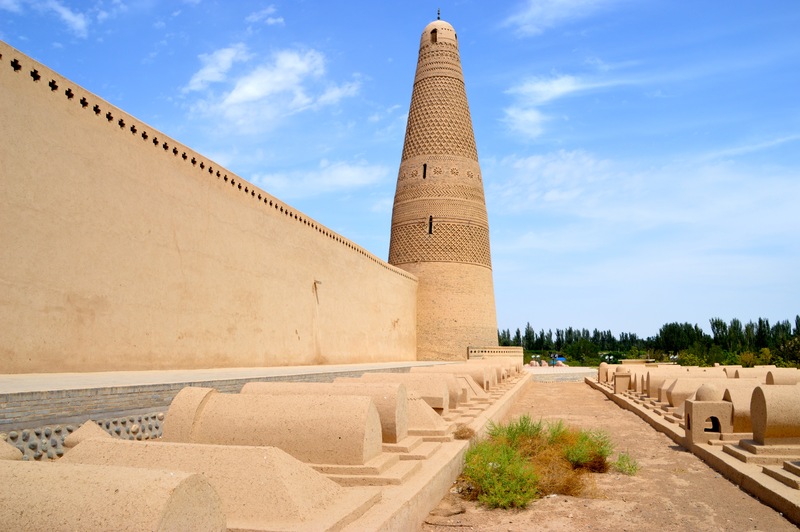 There are tensions between the Uyghur’s and the Chinese government which have often spilled over into bloodshed in recent times. While I won’t go into the politic’s any great detail, I will say it is here that we began to feel the force of Chinese paranoia, insecurity and control. 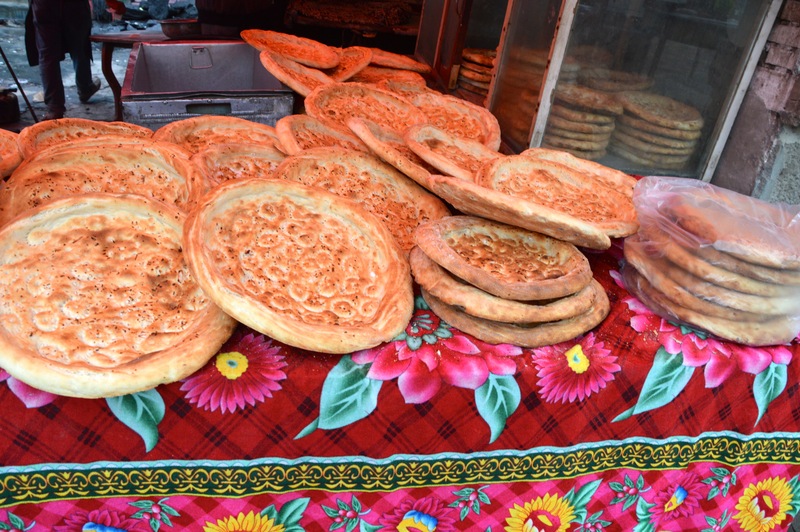 From being moved on by the police, seeing security camera’s in Uyghur towns, barred petrol stations, x ray machines in shopping centres and having our passports scrutinised on numerous occasions. 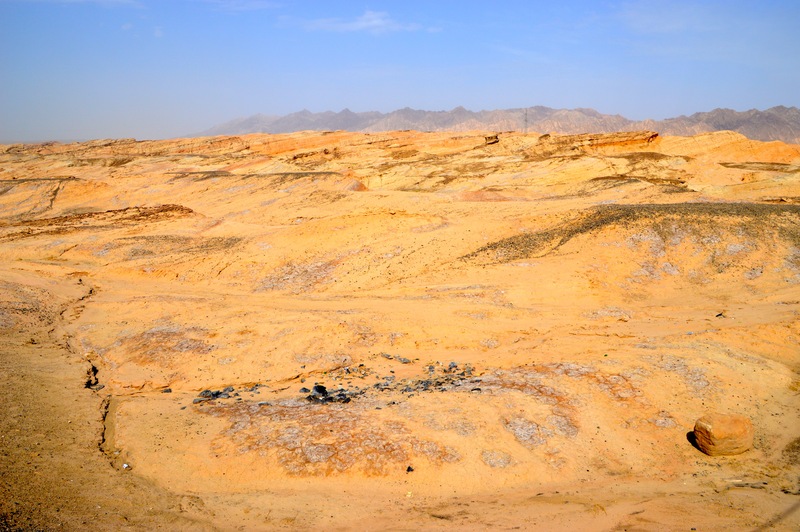 We left the oasis town of Dunhuang with a heavy heart, at least I did. The break had been wonderful, almost too wonderful and it was hard to get going. I was having a rare blue day, where I missed my friends and family a lot. Cycling however, often makes things better. There is something about being on the move that clears the soul and lets the light back in. 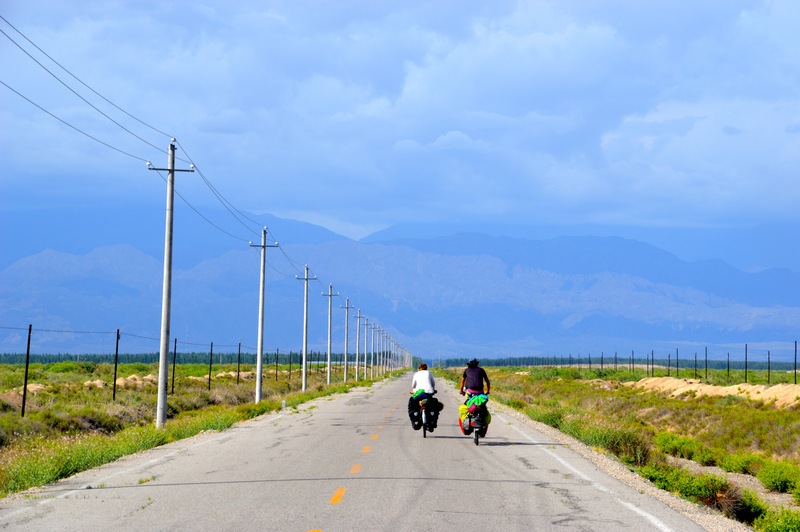 At first we pedalled passed lush vineyards, crops and the small mud dwellings typical of this part of China. 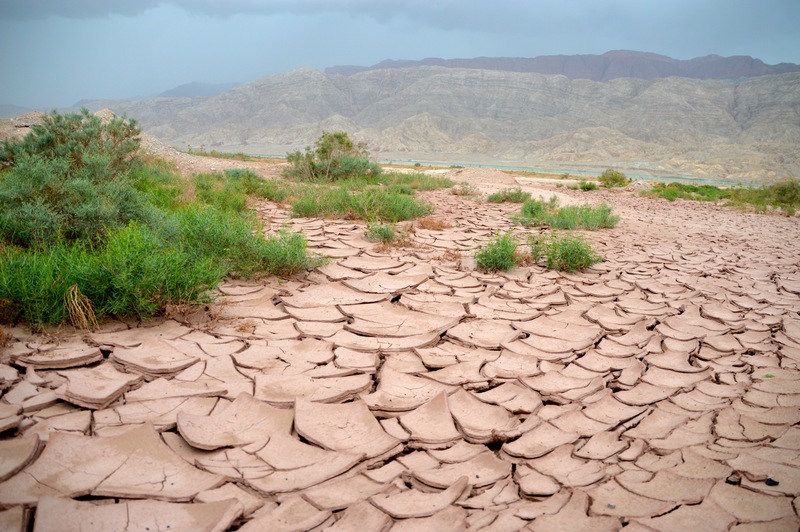 This soon gave way to the starker, dry desert landscape full of bare brown hills. As the afternoon wore on the lovely tailwind suddenly turned and violently spun in our faces, dark clouds flying towards us. A sign of things to come. 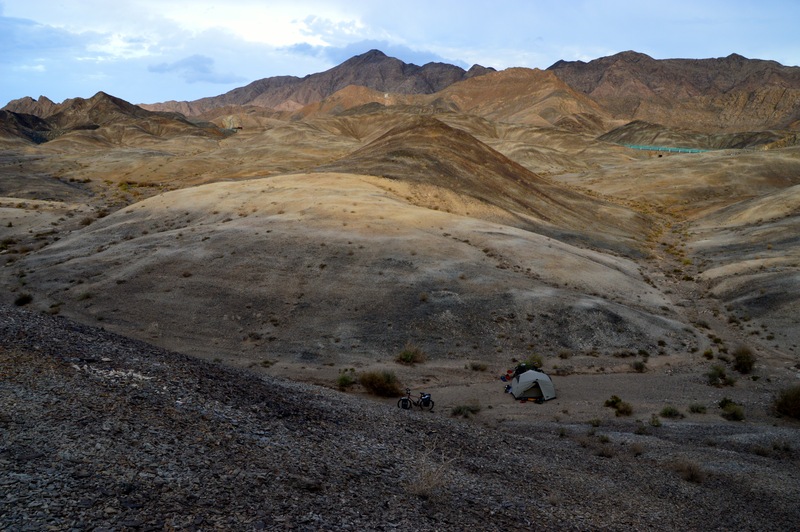 Quickly we pushed our heavy bikes behind some hills and made camp. The next day saw a rainy morning that had us sheltering in a petrol station. It was also the first time we had to give i.d. to buy petrol for our stove. Another sign of things to come. 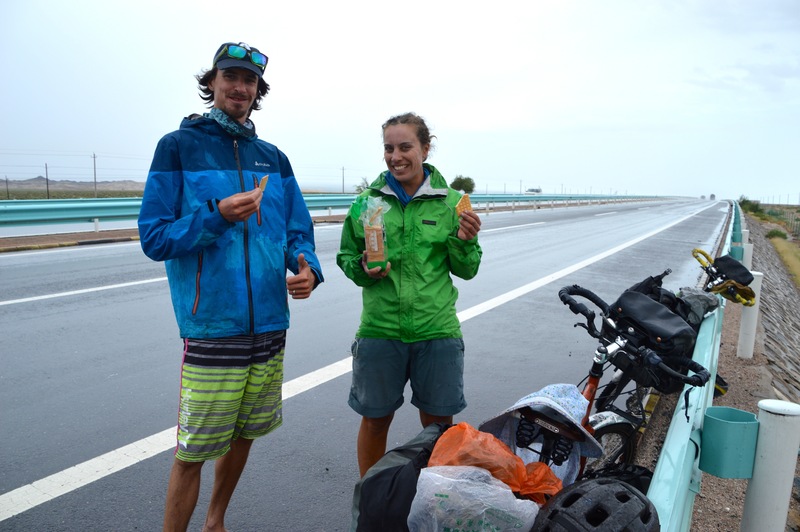 Once the rain had become less torrential we ventured out onto the G30, the main highway, as there were no more secondary roads. 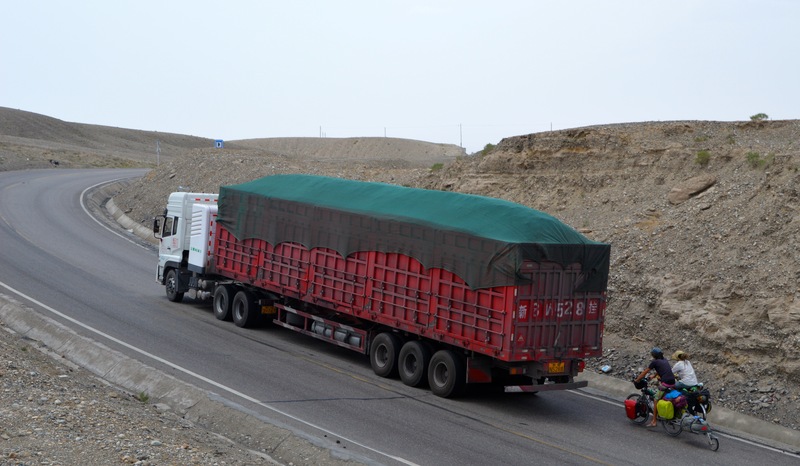 Luckily the road is smooth and the shoulder wide, and the trucks not too annoying. 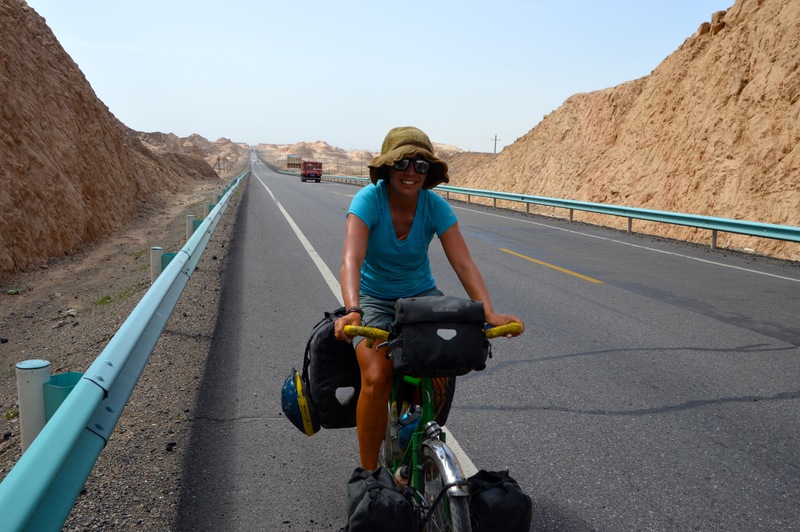 That afternoon we cycled over the border, out of Gansu and into Xinjiang, our last province in China. 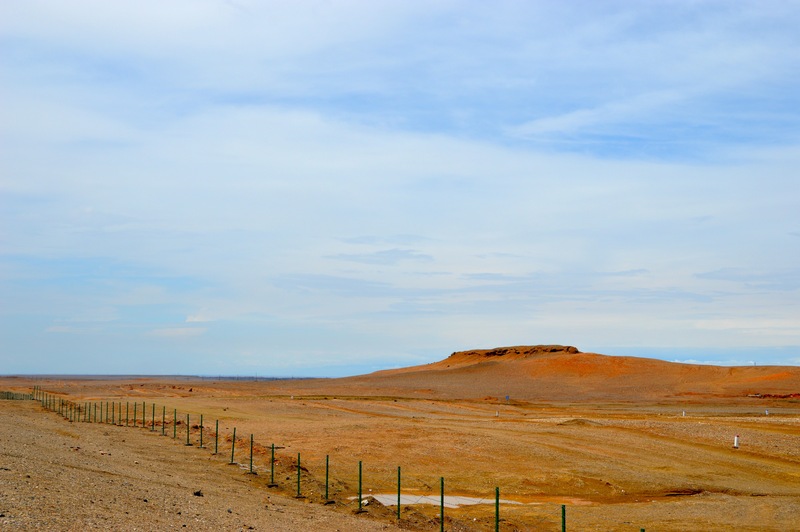 The landscape was desolate, marred by powerlines, and strangely, a never ending barbed wire fence. 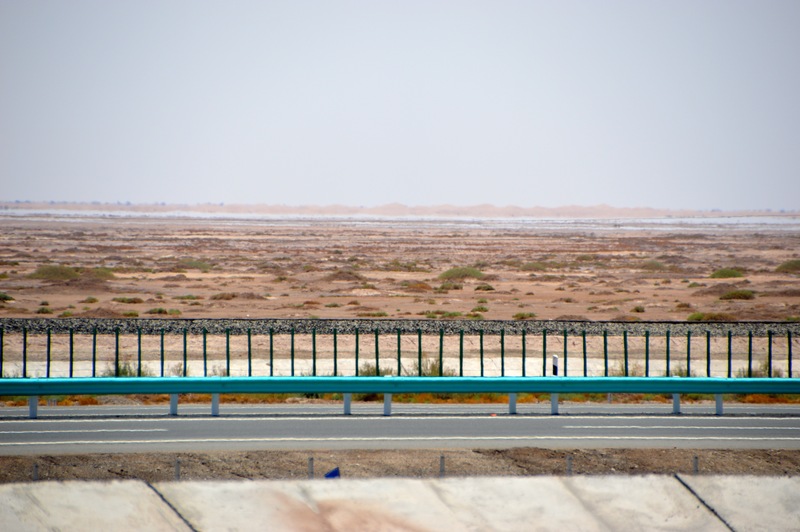 Why fence the desert? It was particularly annoying for us as we had to keep cycling until there was a break in the wire and awkwardly manoeuvre our bikes through to find a place to camp. 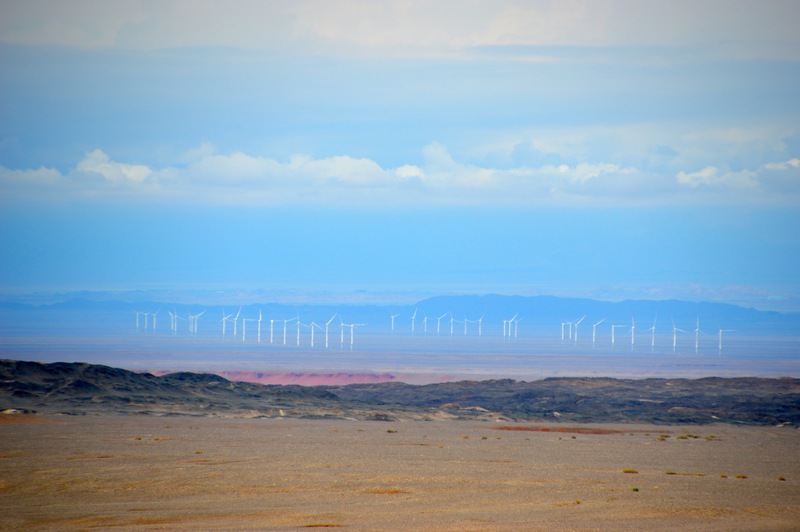 Wind farms in the desert. They may offend Joe Hockey, but we love them. We thought the previous morning had been wet, but now it poured. 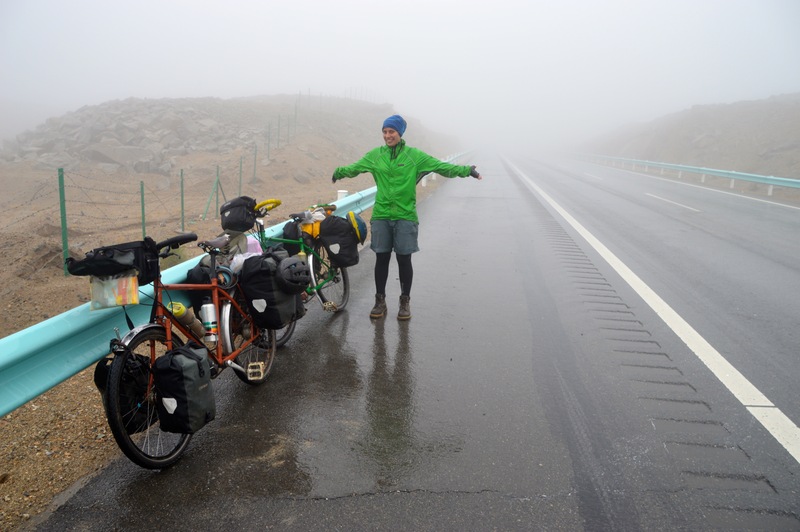 After Astrid fixed her flat we pushed our bikes up onto the highway, already wet and exhausted. Heavy fog descended and our visibility was at about 150m. 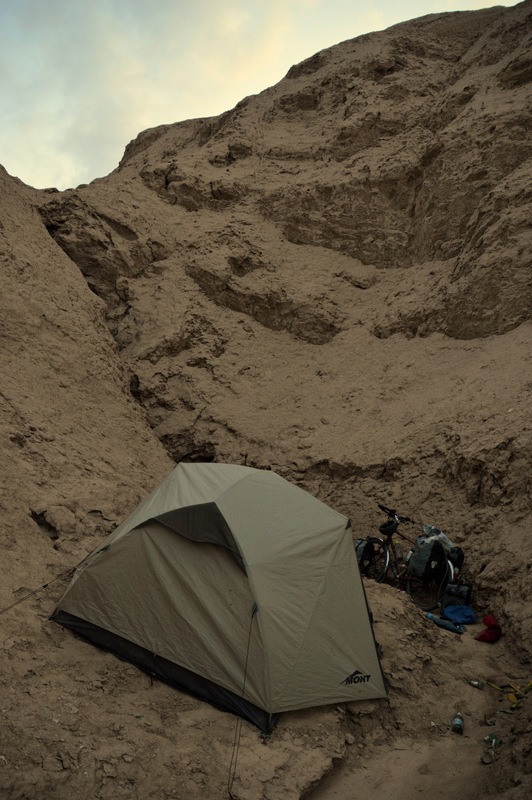 Crazy desert cycling! Eventually it lifted and we slowly dried out. For lunch we stopped at a truck stop, these desolate outposts reminded us of a run down version of the Australian road houses we had seen during our outback leg. 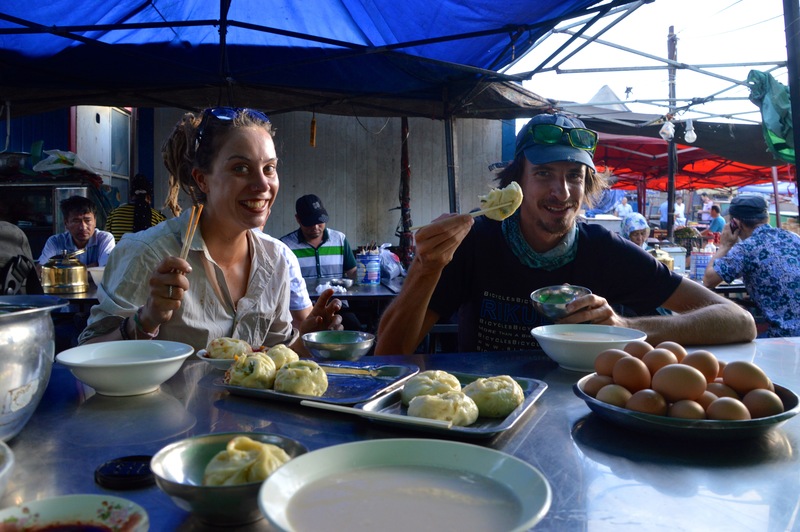 They serve immense plates of noodles for about $2, perfect for a ravenous cyclist. The food almost makes up for the human excrement found scattered on the road around these abodes, as it seems truck drivers do not like to bury their poo. Looking on the bright side, it did lead to the invention of the game ‘dodge the poo’. 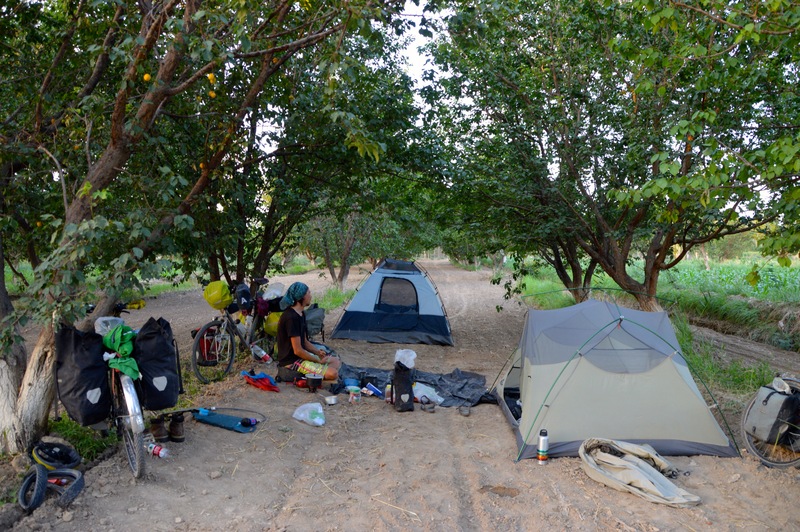 Due to the barbed wire it was difficult again to find a place to camp and we had to make do pitching our tent behind a dirt embankment, not far from the noisy road. Still, it was the first clear night we had had in ages and the sky was amazing. 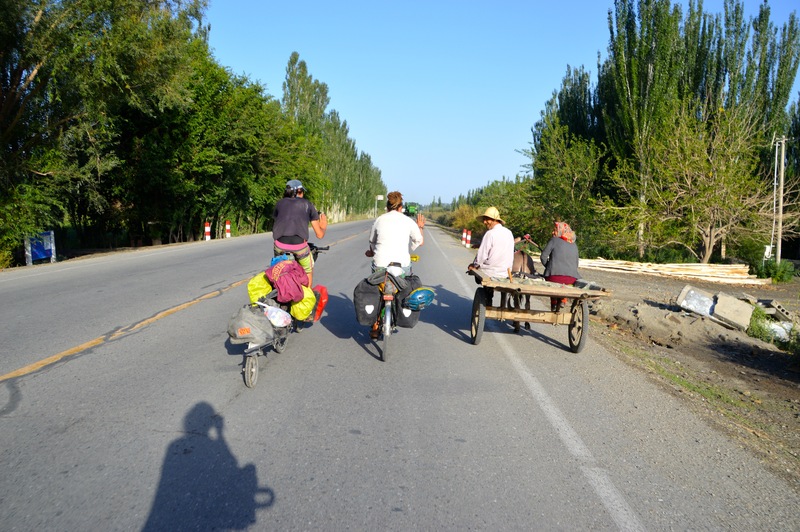 The following morning we pedalled into Hami after experiencing the most amazing bread, being gifted cucumbers and having two flats. It only took us 4 hotels to find somewhere affordable to stay and this became our home for the next three nights. It was only supposed to be two but Astrid was unwell and needed an extra day off. Aside from visiting the supermarket and one night out, we were mainly hermits. Long term travel is so different to short holidays, sometimes you just don’t feel like ‘seeing the sights’ but would rather recharge and watch Orange is the New Black in your underwear while eating yogurt. 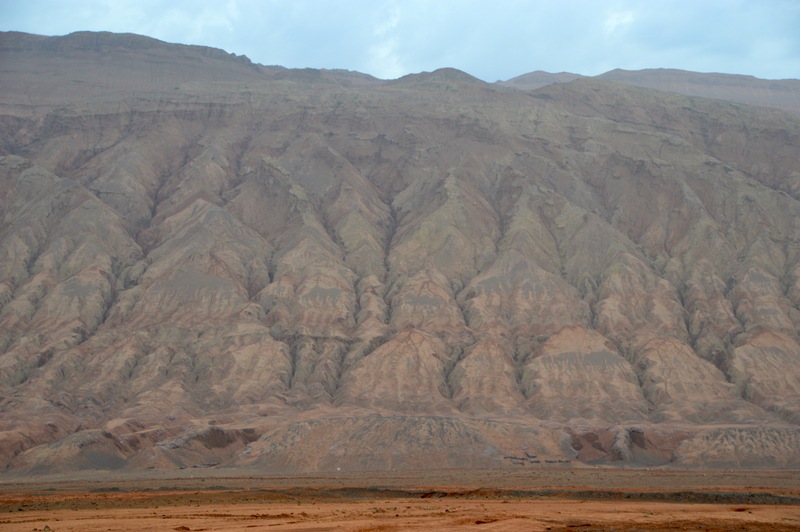 Once out of Hami we were a little perturbed to learn that Turpan was 100km further than we expected. The problem with not being able to read Chinese characters. From here on in it grew hot. Really hot. The sun beat down relentlessly, the wind was temperamental, often starting as a tailwind, only to spin around mid morning to become a sheering headwind. Plus we were climbing, often in 40 degree heat, wind in our face. 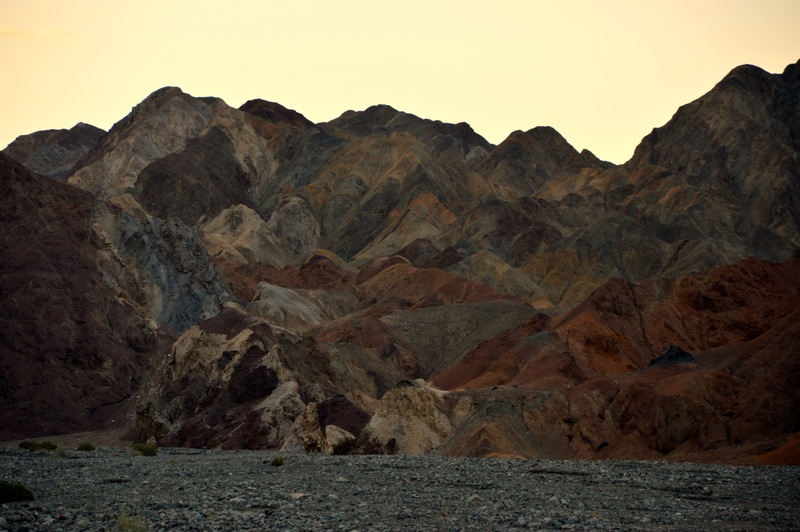 Although the climbs were tough, they afforded views of the most dramatic and beautiful landscape. Petrol stations were our saviour, offering cool drinks and respite from the heat. 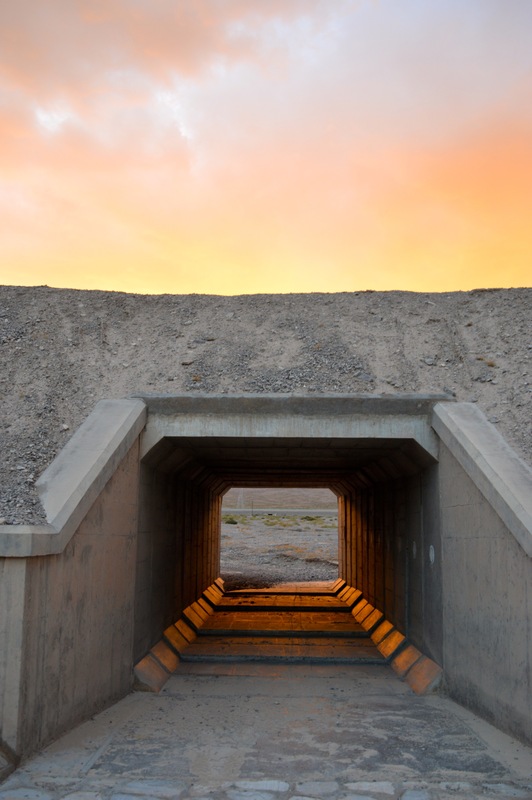 At night we sheltered under road tunnels because the sun didn’t go down until 10pm (everything runs on Beijing time here) and it remained stiflingly hot until it sunk below the horizon. 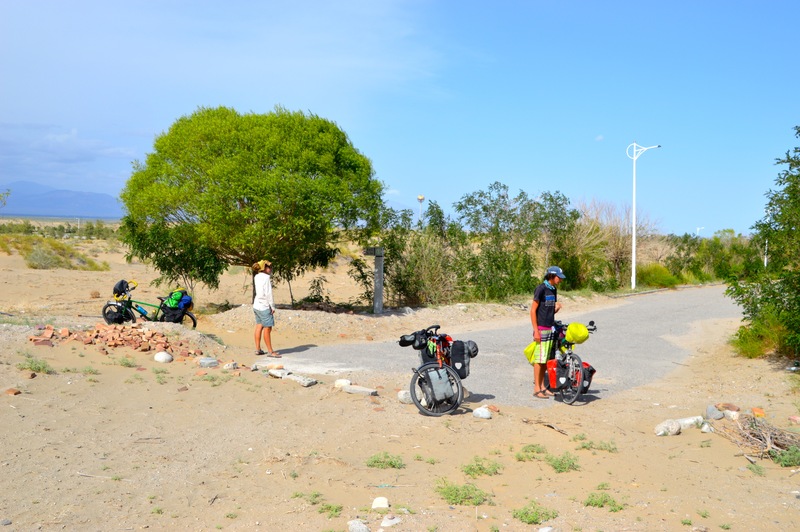 The day before we reached Turpan it was so hot we could literally cycle only a few kilometres without stopping to rest and guzzling water. 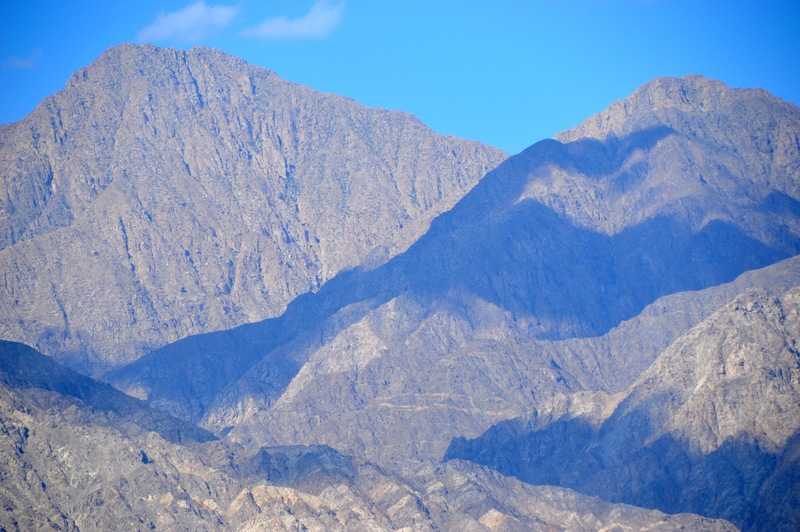 Luckily we were on the edge of oasis’ towns and irrigation channels from the snow capped mountains in the distance offered much needed relief. It was remarkable how quickly our clothes dried after being saturated. 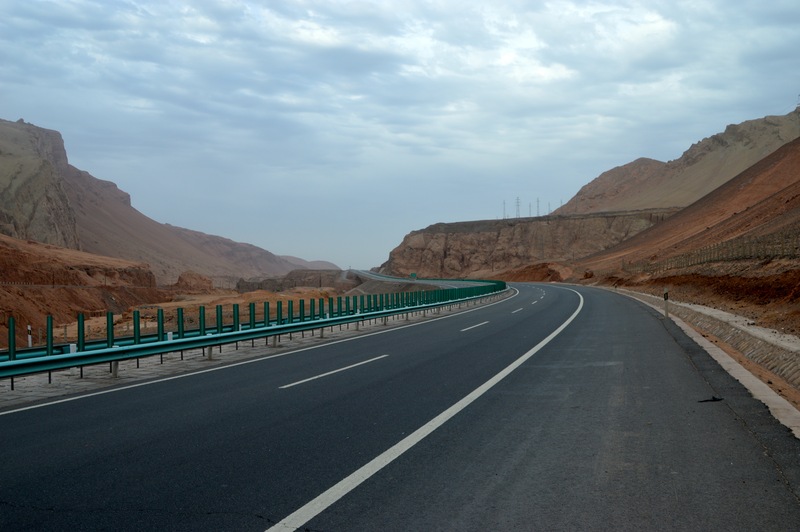 After 4 days of tough cycling and a hot, sleepless night in another road tunnel we rolled into Turpan, the second lowest and second hottest place on earth. 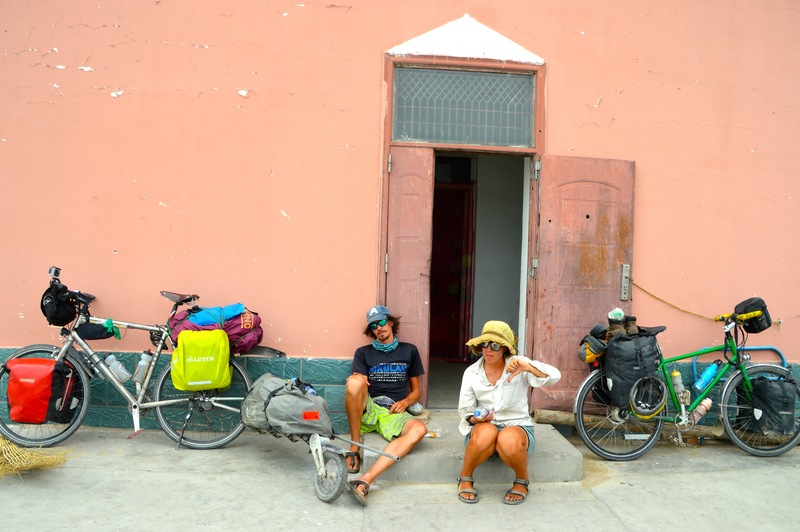 The cycle in was absolutely stunning and the hostel we found a true refuge. 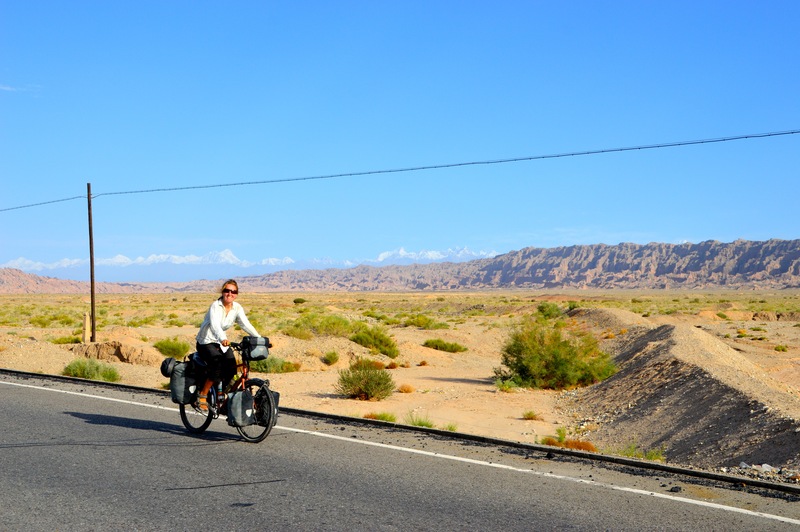 One of the first things I saw when we arrived was another touring bike. A heavily laden one, suggesting a long adventure. The owner did not appear to be around though. Logging on to my email I found a private message from someone responding to a post I had put up on Caravanistan (the place for all things Central Asian). It was from a cyclist called Neil, he had seen my post and wondered whether our paths would cross. 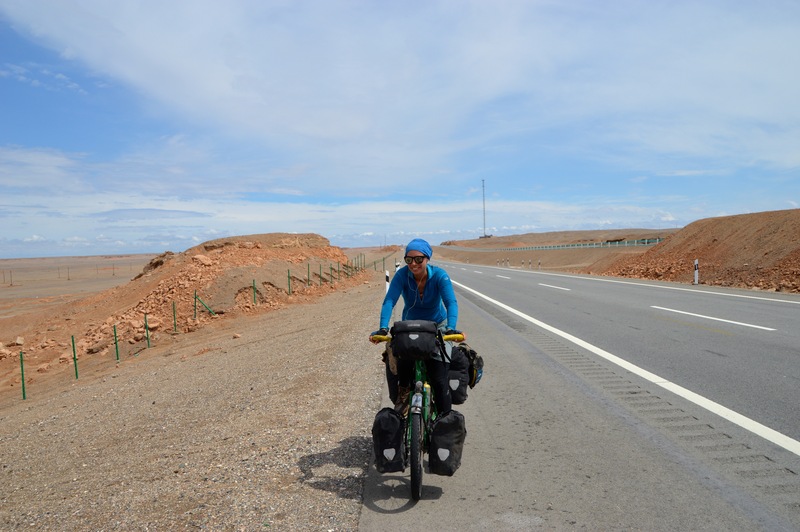 It was his bike that stood in the foyer of the White Camel Hostel as he was on a visa run in Urumqi and would be returning the next day. Beers were planned for the next afternoon. 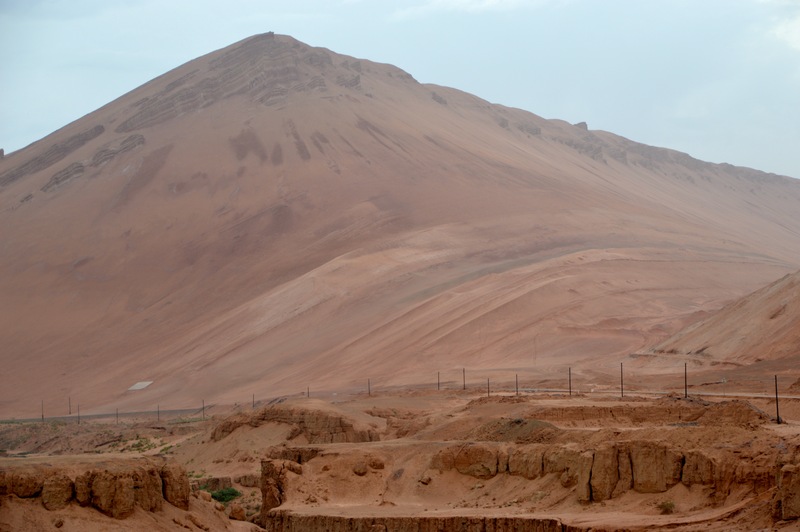 Although we were tired, we decided to tag along to see the Minaret in Turpan with two other travellers we got chatting to at the hostel. It was stunning and the first Mosque I have ever been in to. The rest of the evening was reserved for beers and Street food. 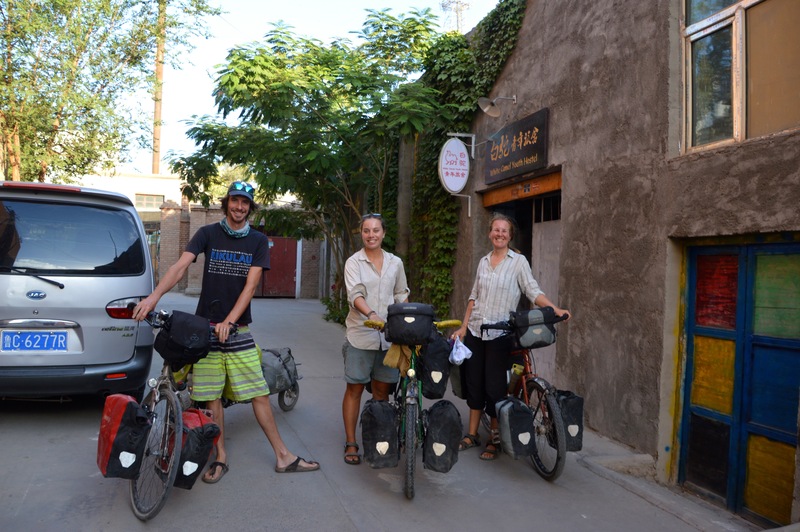 After visiting the museum in Turpan and learning more about the Silk Road we relaxed until the arrival of Neil the mystery cyclist, a South African living in Taiwan and cycling back to Cape Town (h2htrip.com). There was an instant connection (something about our Southern Hemisphere commonality Neil reckons) and we laughed and shared stories from the road. It turns out Neil (who speaks Chinese) had heard about us, and had even been shown our photo by a noodle lady who had taken our picture. 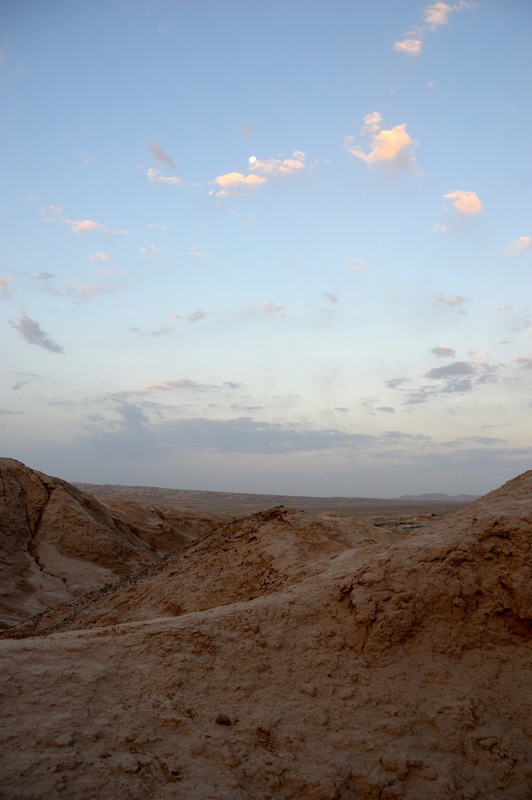 He knew that we were two days ahead and had tried to catch up, but when we turned off to Dunhuang, he had given up. 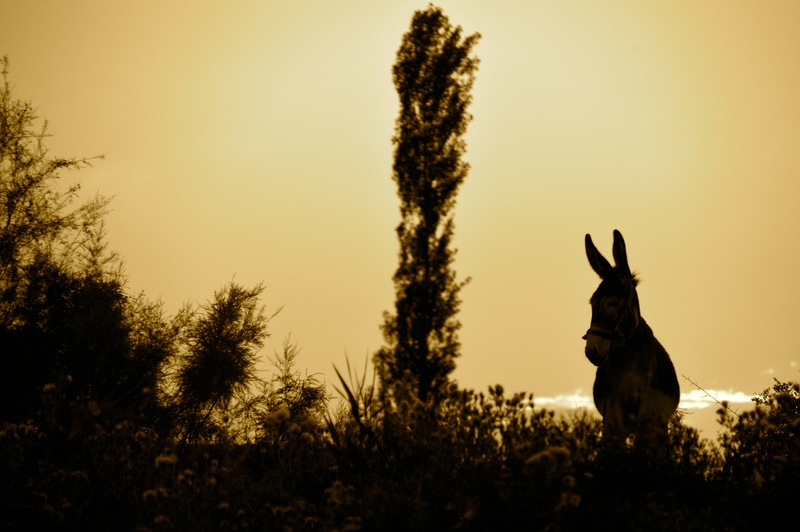 However, because we stayed there so long, we had ended up behind him and now our paths had finally crossed. 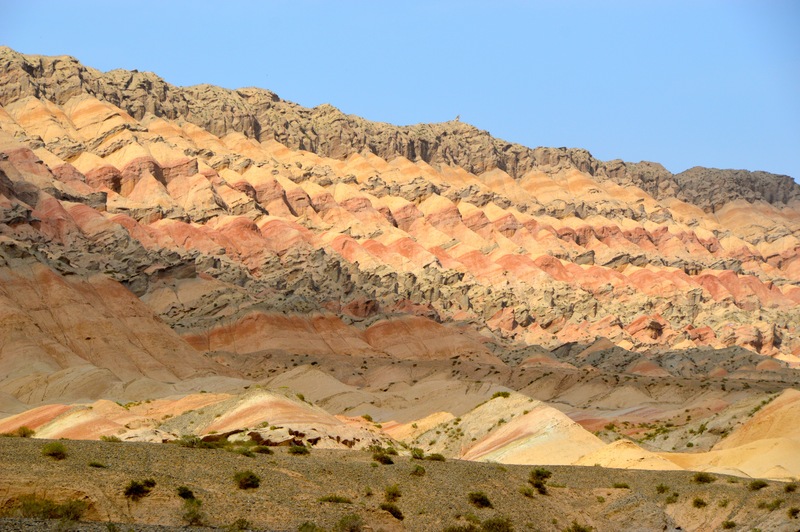 Neil however was going to Kashgar, not Urumqi and Kazakhstan like we had planned. 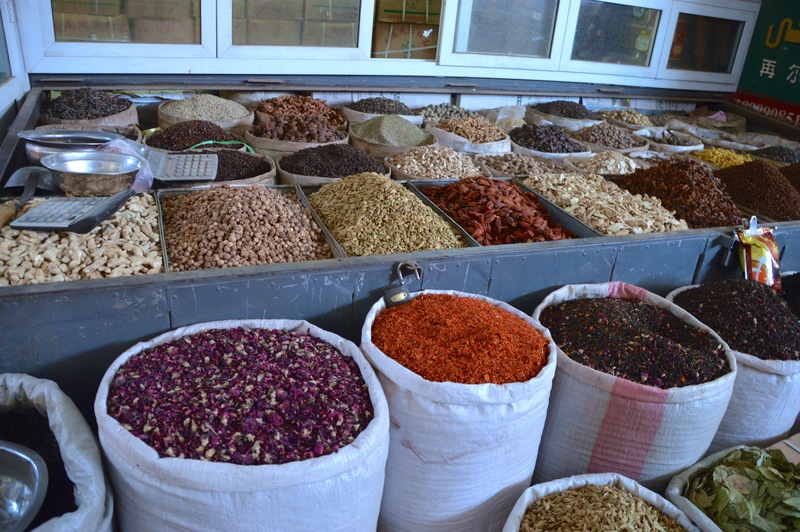 The more we talked, the more the idea of continuing on the Northern Silk Road with Neil and culminating our China trip in Kashgar, a town that embodies the Silk Road appealed. 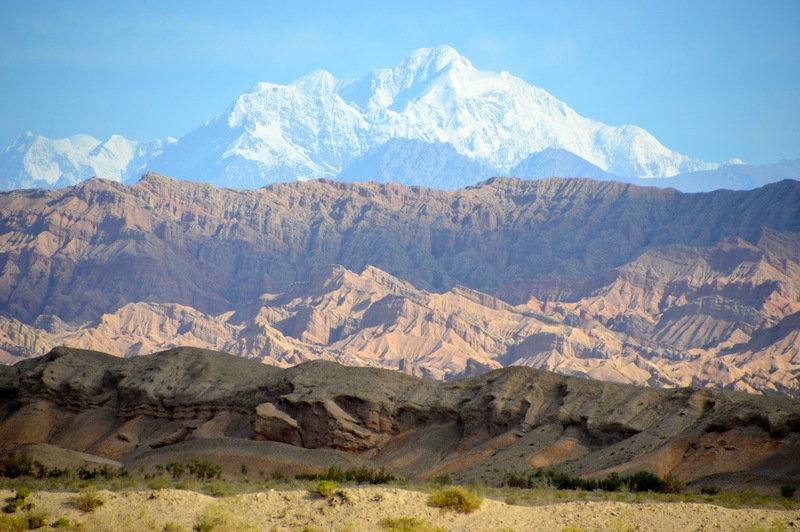 And for Australian’s Kyrgyzstan is visa free, meaning no lengthy waits for embassies to process our visa (we were looking at 7 days for Kazakhstan). 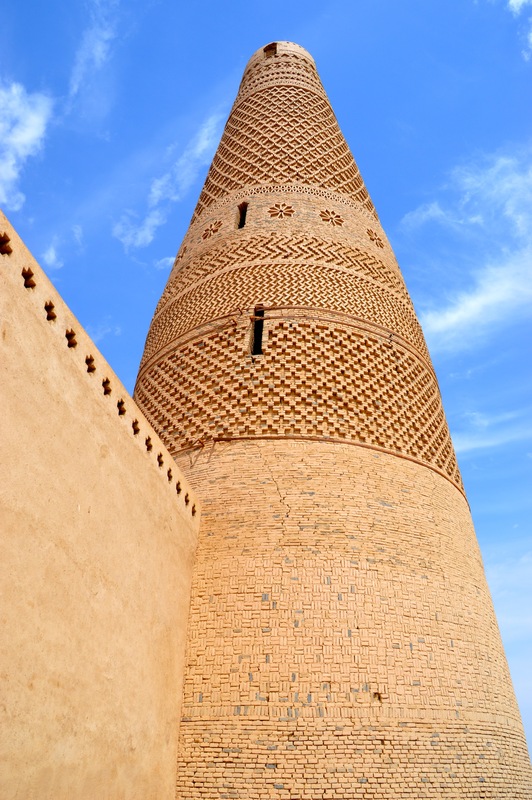 This along with the fact that Kazakhstan is immense and we would not spend much time there anyway, changed our minds and we decided to join Neil. Having the freedom to do this was awesome. 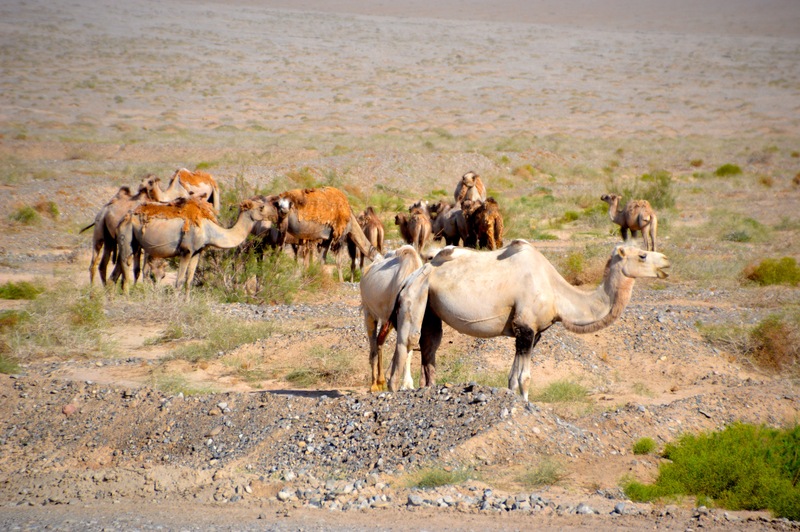 So it was the three of us that set off from the White Camel the next morning, both parties happy for the extra company. Astrid and I love cycling alone together, but having someone else along is a lot of fun too. Being the second lowest place on earth we inevitably had to climb. After a cruisey morning looking at the range coming closer, we began to climb. It was hard going in the heat, but drivers gifted us cold water and a massive watermelon. Nearing the top we pulled off and made camp in amongst some beautiful, stark brown hills. Taking encouragement from Neil, we ditched the tent and slept out under the stars. 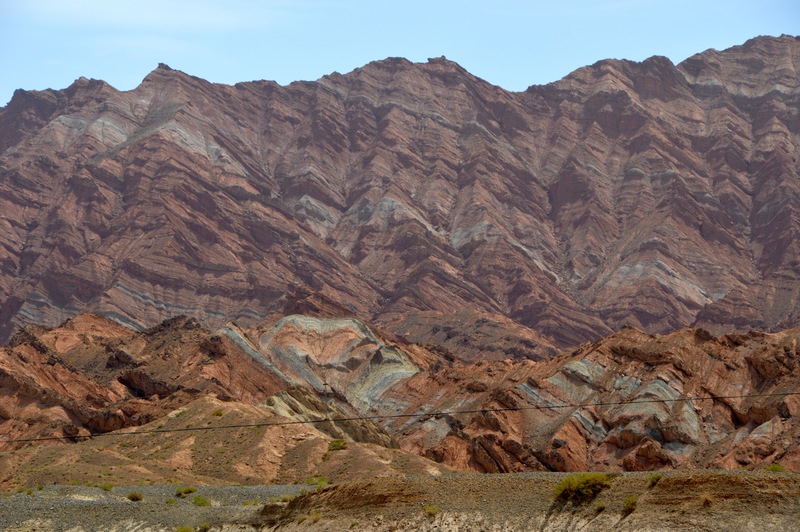 The next few days saw us alternatively climb through beautiful rocky landscape and sailing along the G30. Well, not exactly sailing. More stopping and fixing flats. This part of the highway is notorious amongst cyclist for the staples from the truck tyres that puncture our inner tubes. Our situation wasn’t helped by the fact that our tyres had done over 15,000km and were looking rather worn. Plus, our elderly inner tubes had started to break at the valve, something we couldn’t easily fix. 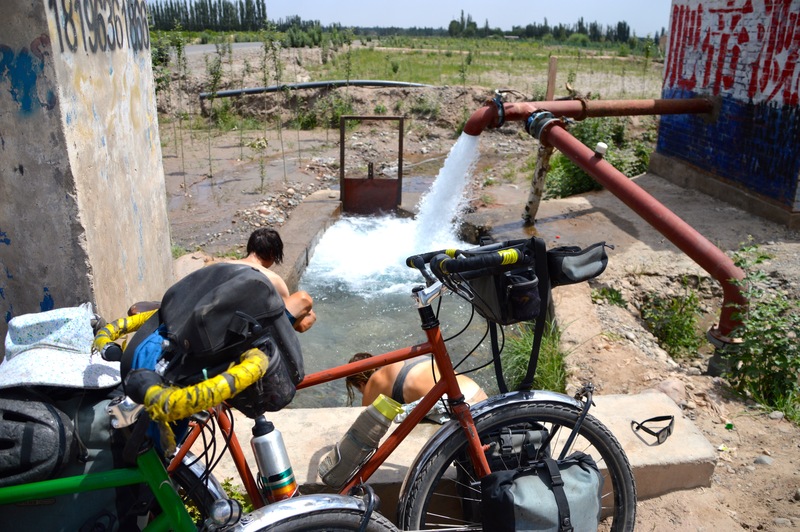 This was complicated further by the fact that our French valves (common on touring bikes) were not common in China and we had been unable to purchase any inner tubes in Turpan. There was some potential for disaster but luckily we were spared. However after having 5 flats in one day I finally conceded and replaced my aged rear tyre with a shiny new one. It was during this time we began referring to the G30 as the ‘dirty 30’ and we tried to avoid it as much as possible. There weren’t always back roads, but when there were we were dually rewarded. They passed through poplar lined oasis villages where we snacked on bread, samosas, cold noodle, and were gifted melons, and dried apricots. 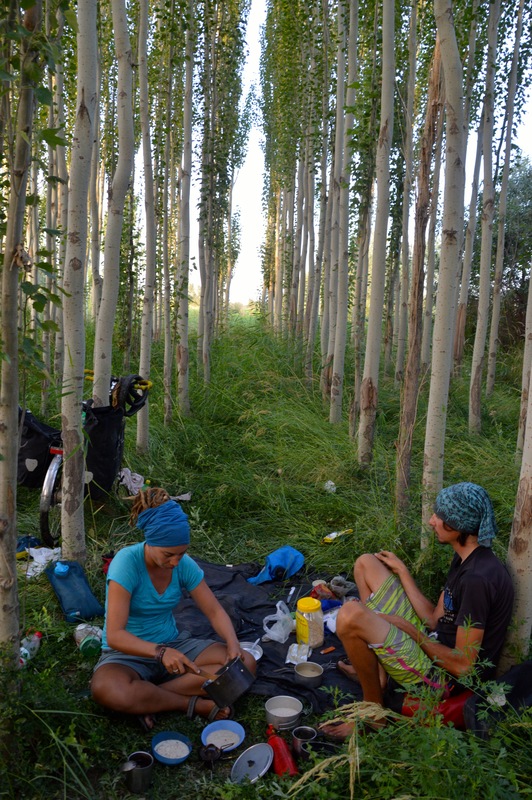 At night we camped in tree plantations, or at the edge of fields, the only thing people wanted, was ask us to dinner and to let us know that we could contact them if we needed anything. 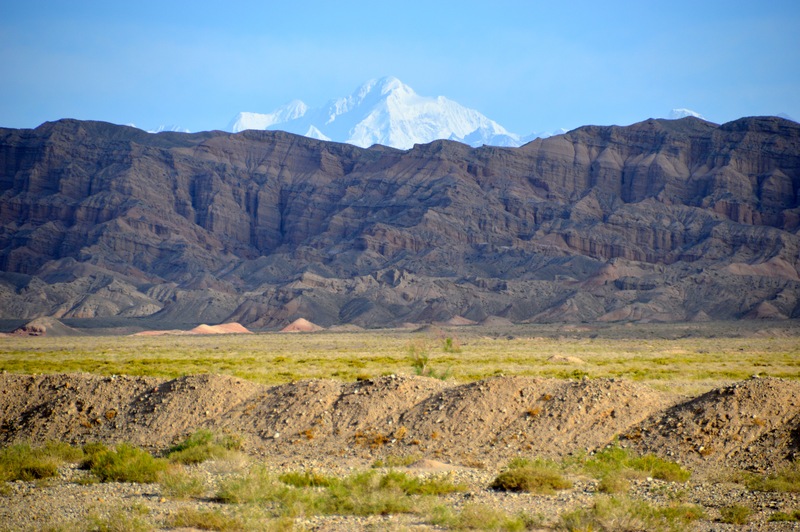 We slept under brilliant star lit skies, the mountains of the Tian Shan on our right, the immense Taklamakan desert on our left. 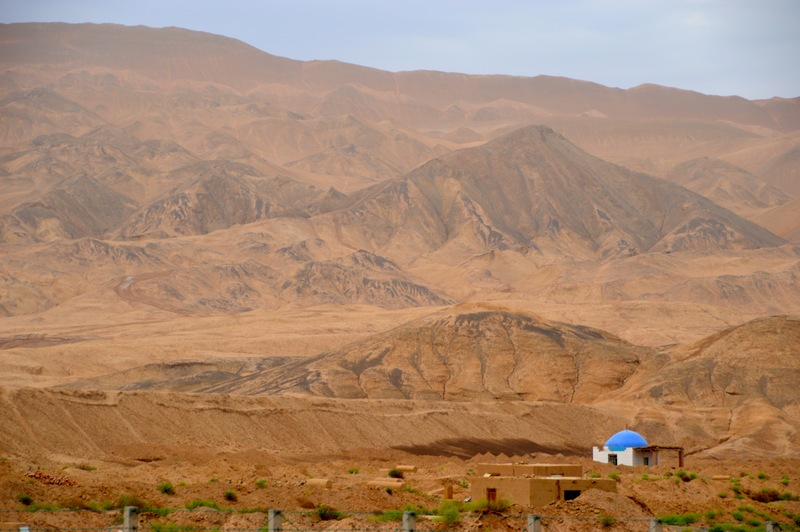 The people who live on this thin strip of land between these two immense forces of nature, channel the snow melt from the mountains for irrigation, the same way it was done when the caravans passed through these regions a thousand years before. With all its modern infrastructure it is not always easy to get a sense of the past until you get off the main road and spend some time in these villages. Bread was our staple. So amazing when fresh. So many second breakfast options..
And the road bloody ends! Unfortunately it was not all villages and open skies. This is still China, which means huge, ugly, soulless cities. 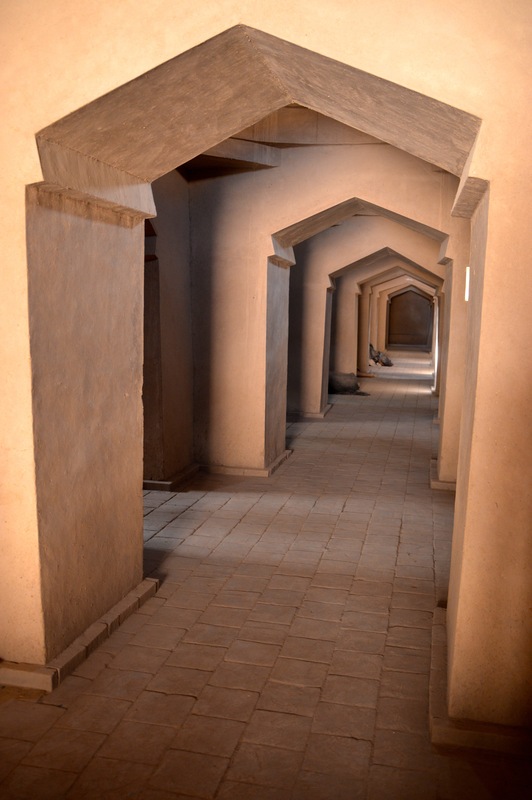 Korla was one such city, where we stayed in a backpackers for a night. We kind of regretted it and left as quickly as possible. Kuqa was another such monstrosity, but we had decided to stay just outside of it so we could visit the Bazaar the next day. Unfortunately, the police had other ideas. 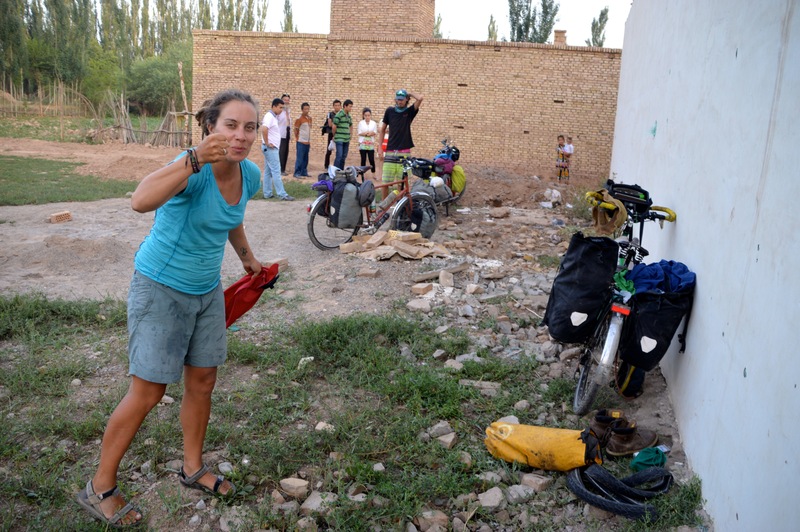 We had been invited to camp behind a small Uyghur village and were just getting stuck into our second cup of tea when the police turned up. 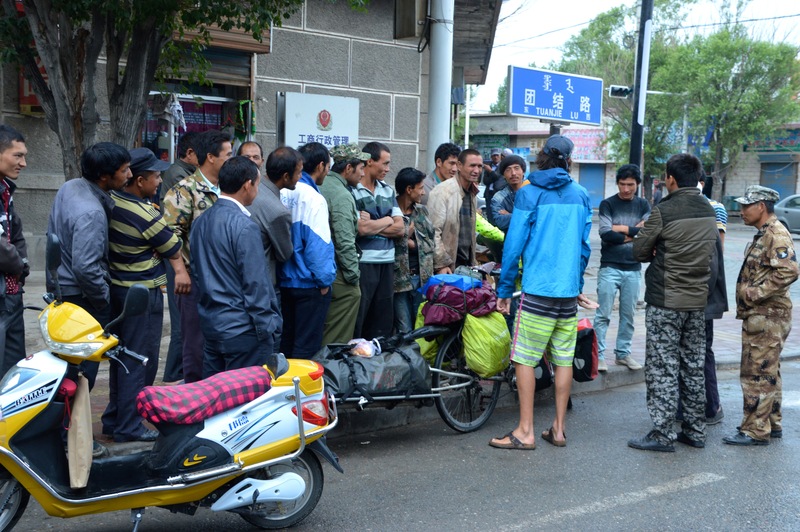 Even with Neil’s mandarin we were unable to talk ourselves out of being escorted back into town to a dingy hotel. 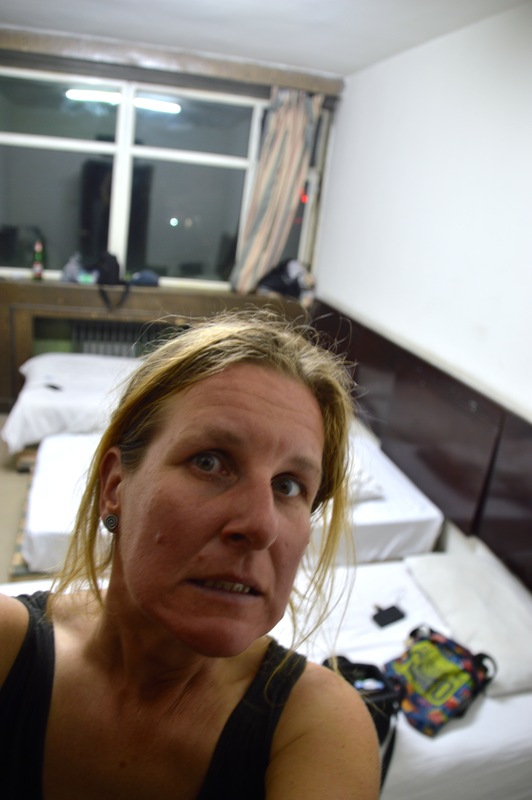 Apparently it was Chinese law that we stay in a hotel and the village was dangerous. Yep, that 80 year old Uyghur grandpa certainly looked like a killer. The hotel was an absolute dump. I don’t think the toilet had ever been cleaned and ‘man shower’ had piles of dirt in it, and possibly the floor was going to collapse at any moment. And it wasn’t even that cheap. Massive fail. What was even more of a fail, was that the bazaar wasn’t happening till the afternoon. 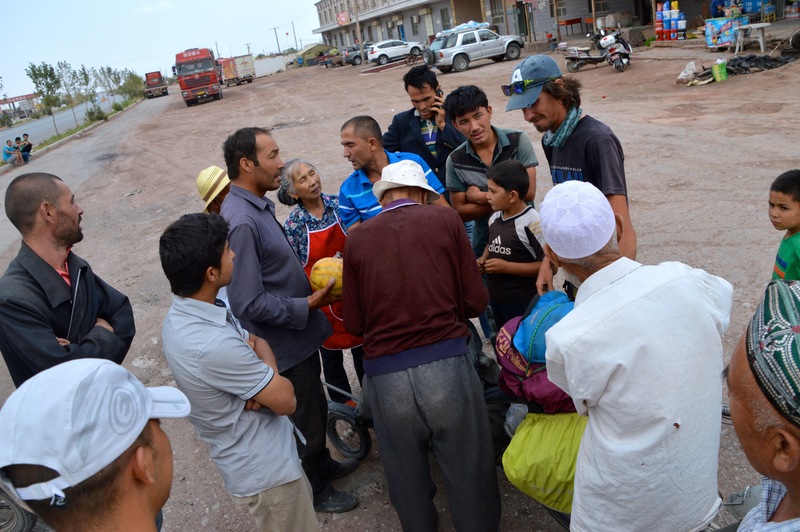 We did not want to wait around, Kuqa felt oppressive and unfriendly, the tension between the police and the Uyghur’s palpable. So we left and cycled into what we named ‘The valley of paranoia’. 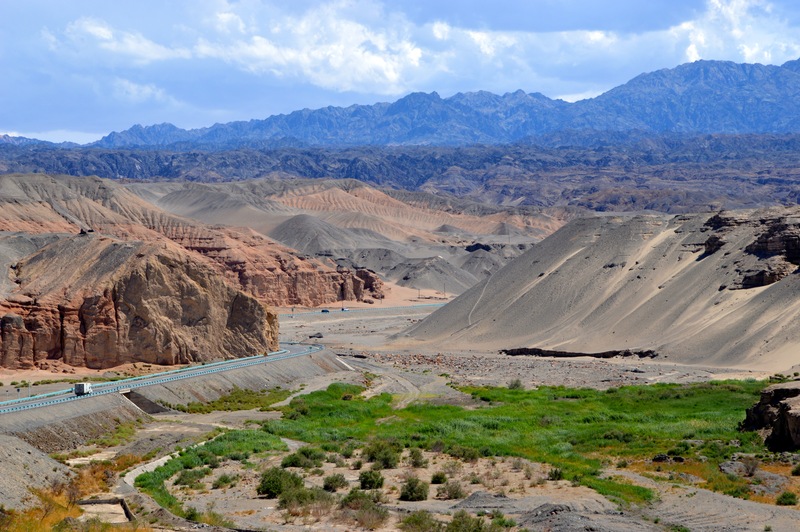 It was off the G30, a valley that ran behind a mountain range and the massive Tian Shan (pretty much parallel to the G30). We thought it might be nicer than staying on the ‘dirty 30’. Well, it was, except for the police harassment. It’s nothing compared to what the Tibetan’s and Uyghur’s face, but after going through checkpoint after checkpoint, being approached while having lunch, our passports scrutinised and questioned where we would be staying (Neil managed to convince the police we could cycle 200km in a day) all three of us felt uneasy and slightly anxious. We also began to run into problems with our fuel. 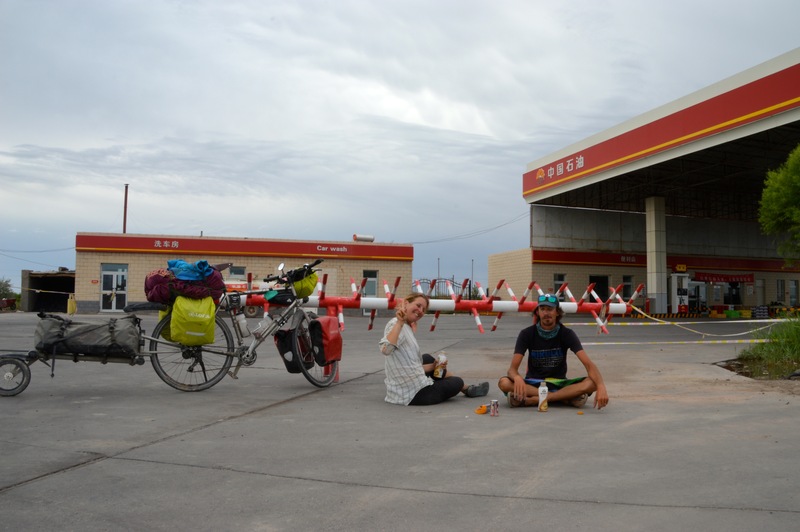 All through Xinjiang the petrol stations are barred. Drivers must let all of their passengers out and only then can they get fuel. Motorbikes must collect it in a jerry can and walk out to their bikes, which are not aloud in the petrol station. 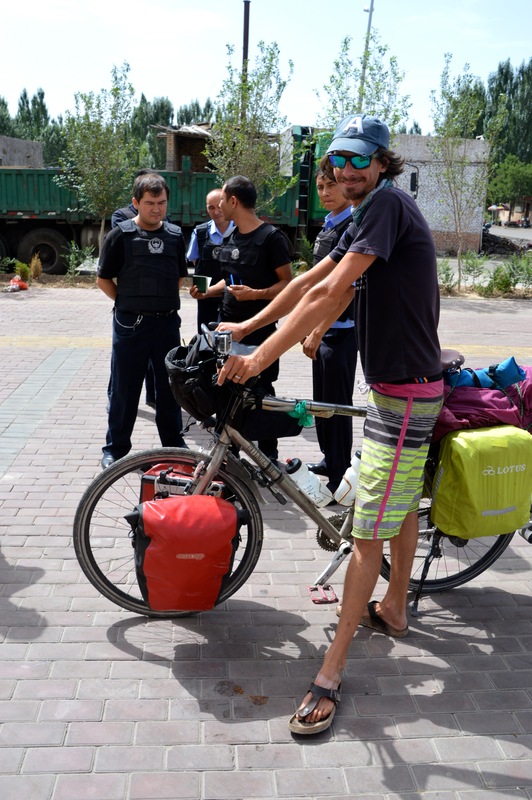 Foreign cyclists are not allowed to park their bicycles inside, nor buy petrol for their stoves, unless they have written permission from the police. Something about petrol bombs. Far out. 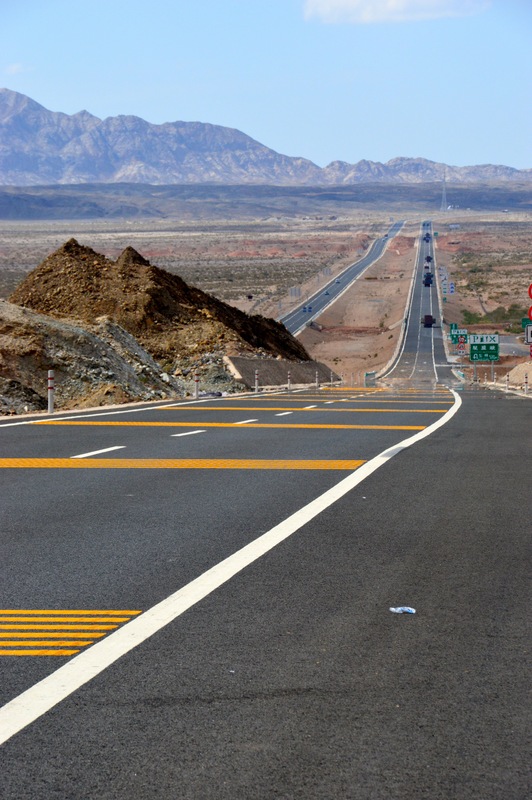 It would take till Kyrgyzstan for us to be able to buy fuel again. Luckily we had just enough. 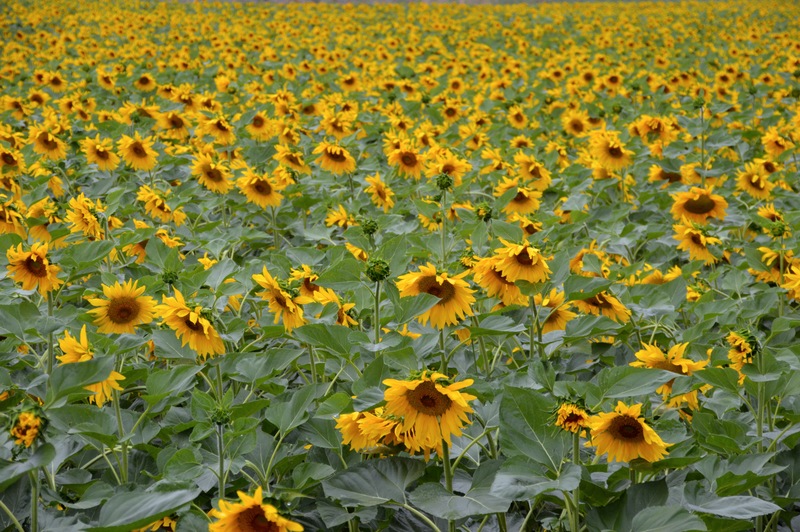 The ‘valley of paranoia’ was however beautiful. 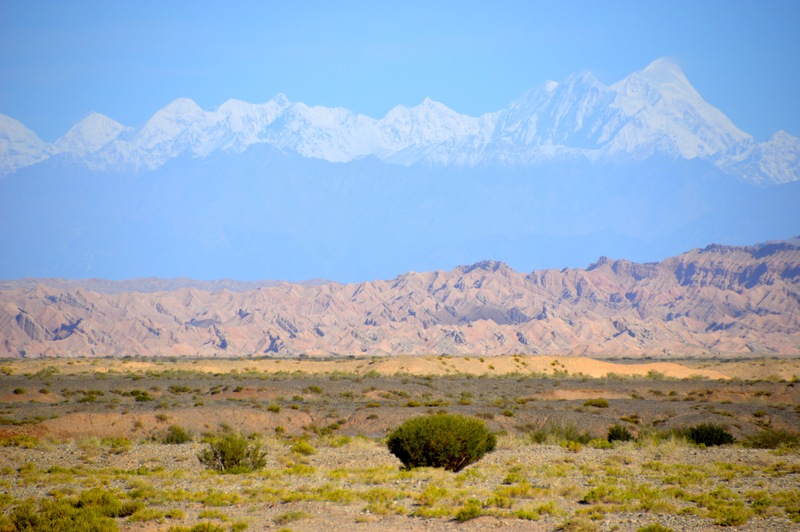 Mostly tree lined oasis villages and right at the end 7000m snow capped peaks of the Tian Shan and spectacular camping. No bikes in the petrol station! 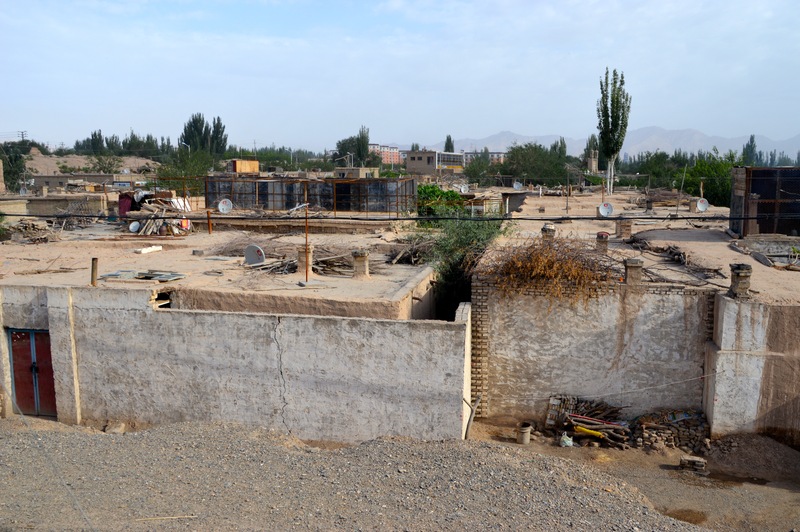 Once out of ‘the valley of paranoia’ Kashgar was within our reach, albeit a long reach. All three of us were tired and looking forward to some days off and we pushed hard to make it in a short amount of days. This meant cycling until nearly 10pm most days. 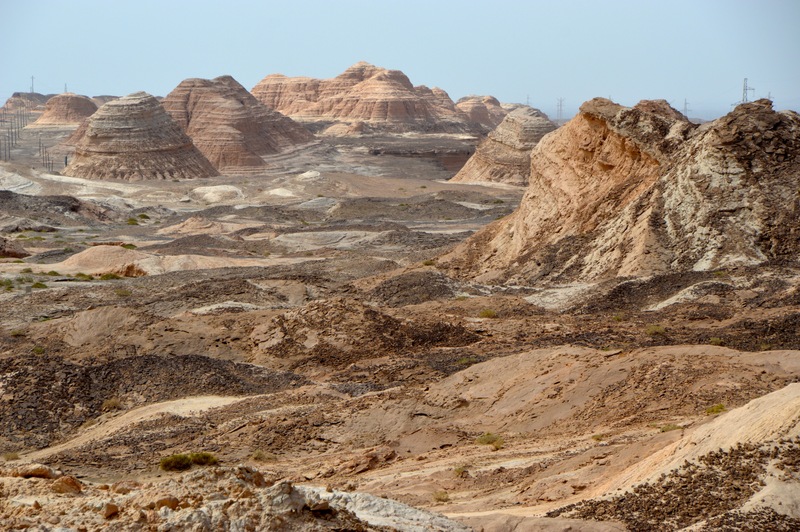 Out in this part of China, we really began to feel the desolate and immense nature of the Taklamakan, as before we had been cycling mainly through Oasis’. 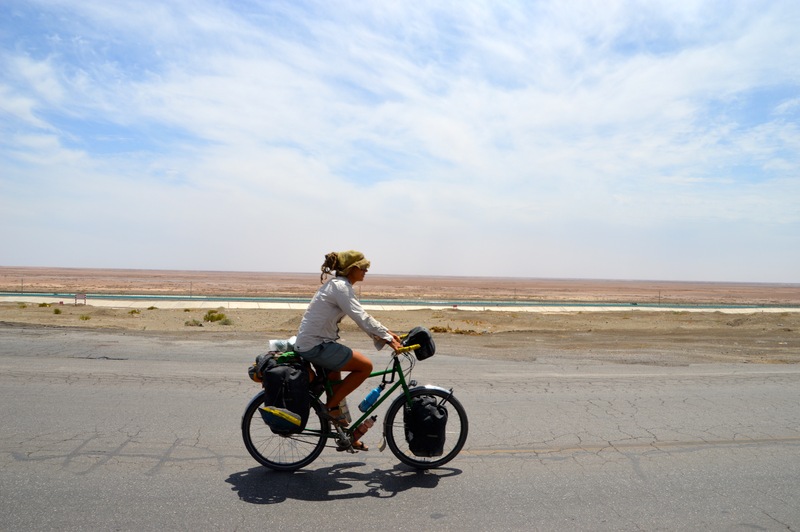 In the headwind and heat, it seemed to stretch on forever to our left, inhospitable and threatening. 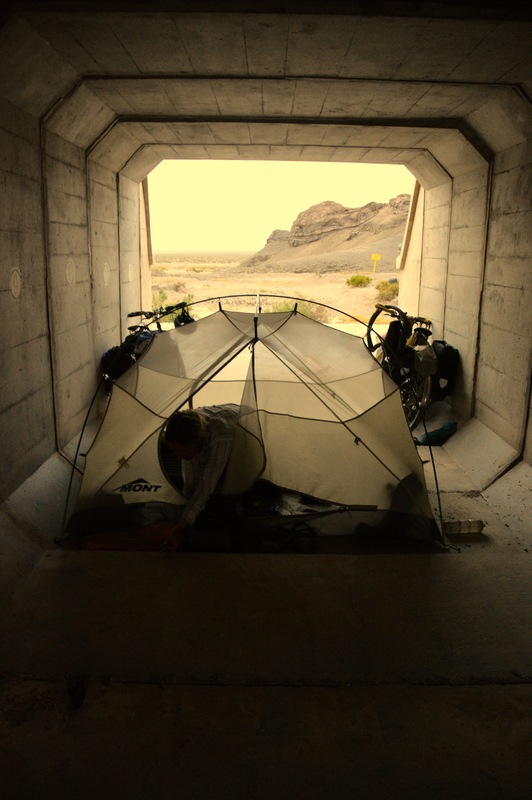 One day we battled it out for 10 hours in the headwind, falling exhaustedly under a train tunnel after 113km. 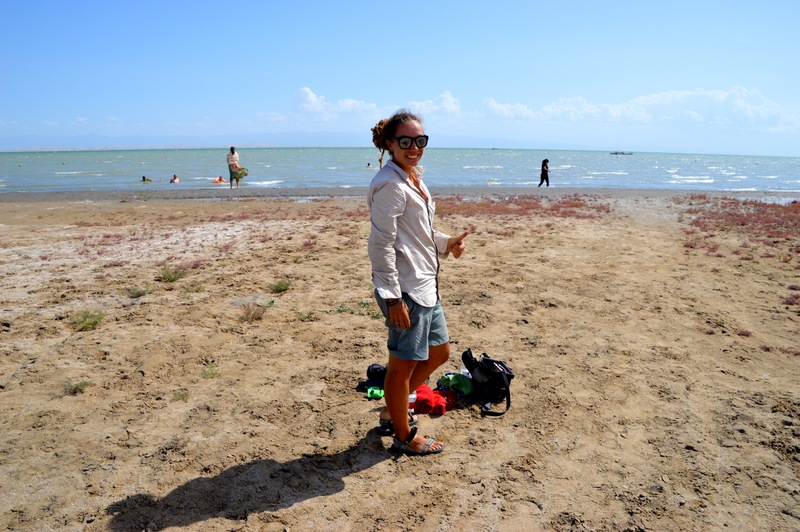 The next day we breezed 172km in 8 hours, a raging tailwind at our back. 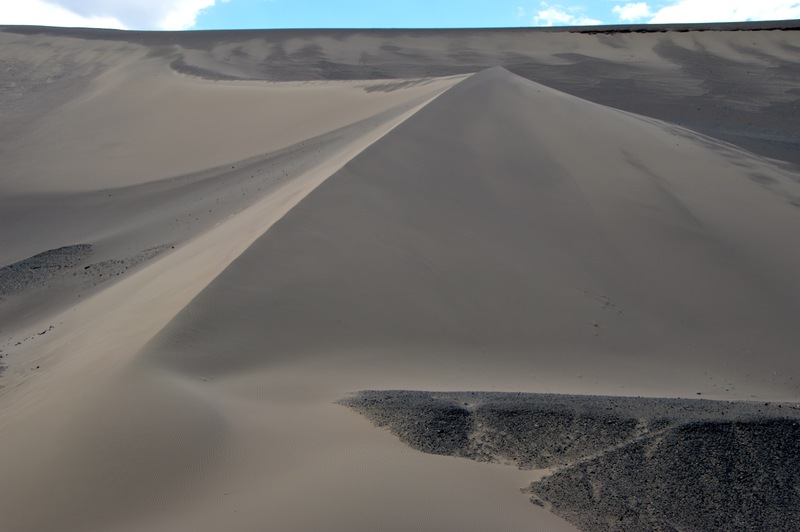 Xinjiang, wait five minutes and the wind will shift. 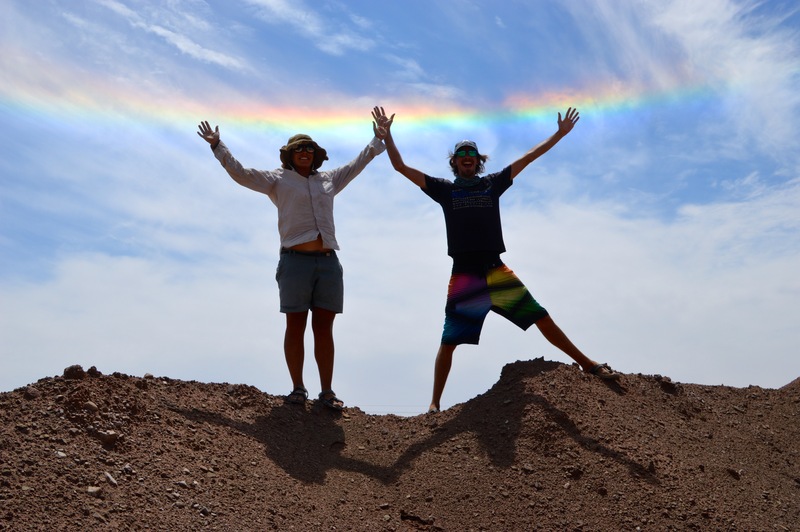 Holding the upside down rainbow. The desert is strange.. Sometimes you cannot find level ground to camp on! 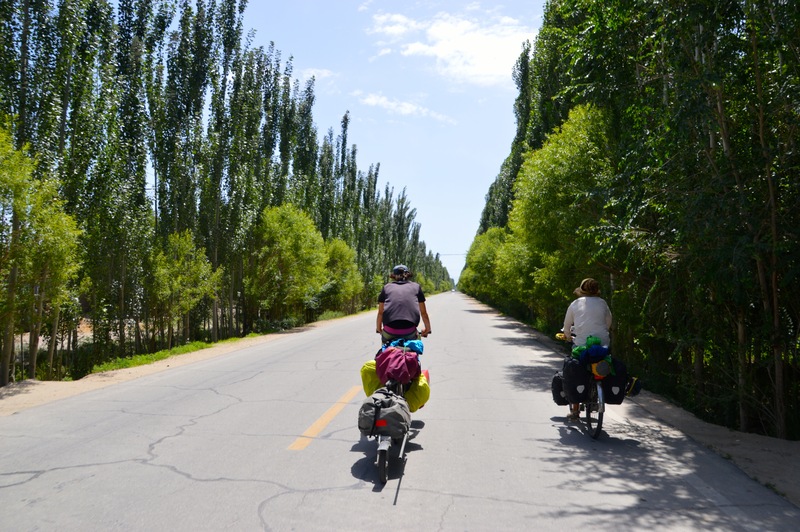 On our final day into Kashgar we woke up early, anxiously wondering whether we would have a ferocious headwind to deal with. Luck was on our side as an uncommitted tail/cross wind blew unenergetically. 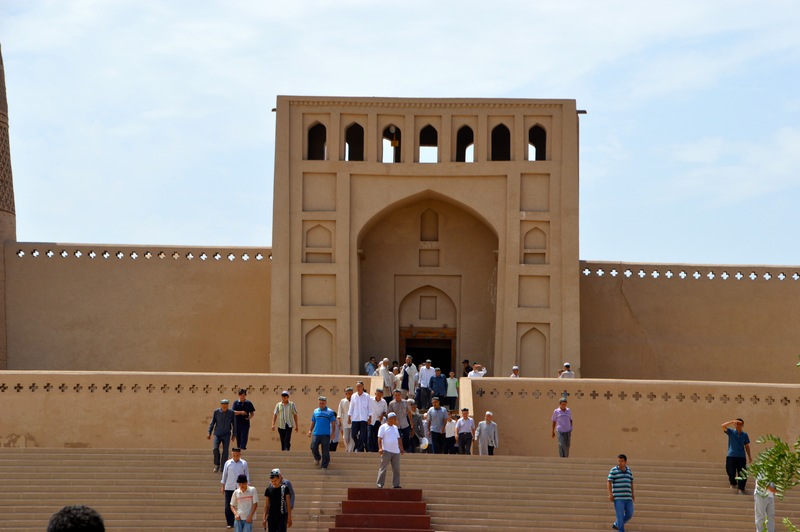 We reached the lively old town of Kashgar in the late afternoon and were no longer in China. Culturally anyway. I have not been to the Middle East but it felt how I imagine the middle east to be. Venders pedalling their wares, sheep being slaughtered, spices, a thousand different aromas, old men in traditional Muslim dress watching the world go by from benches, motorbikes honking, carpets, women in beautiful Hadjib’s, the bustling and chaotic nature of the place was intoxicating. I loved it. We all did. In amongst this was Old Town Hostel, the place we would call home for the next 2 days. 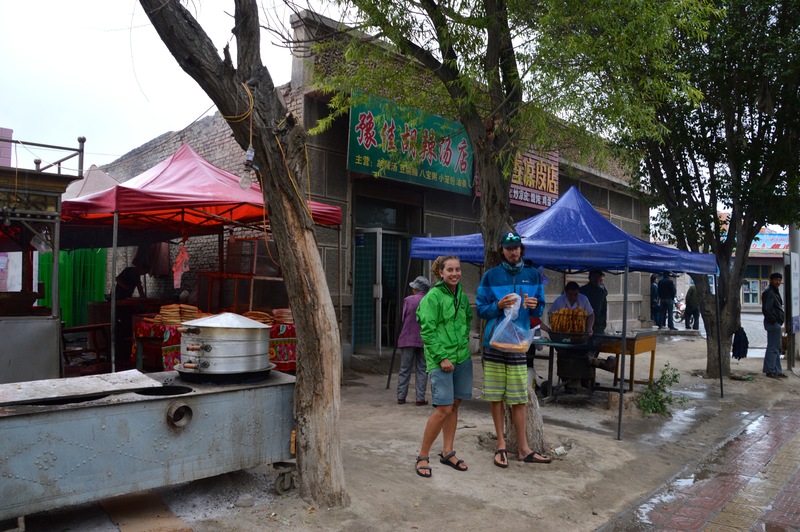 Travellers share conversation and beers around a courtyard, discussing routes in and out of China, long distance cyclist’s tinker with their bikes, and when the dorms are full people simply sleep outside on mats. It’s relaxed and wonderful and the three of us felt incredible happy to be there. 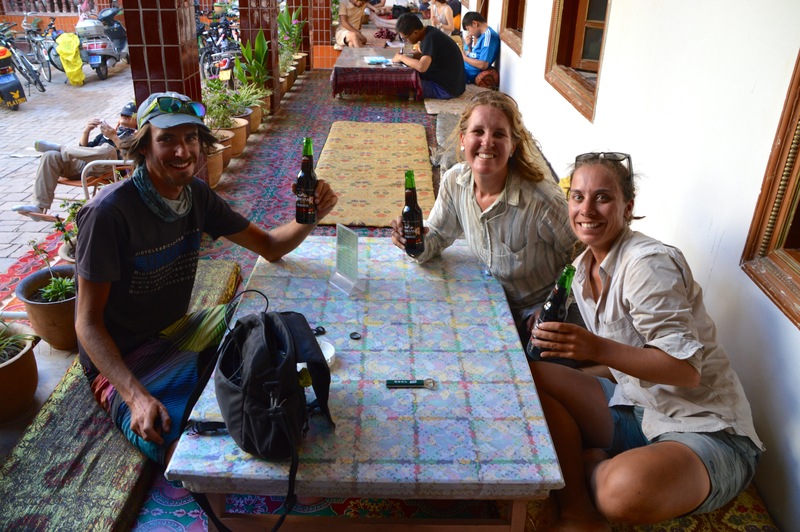 We shared delicious dark beer, celebrating our epic 12 day 1400km journey along the Northern Silk Road. We were really and truly on the edge of Central Asia now. 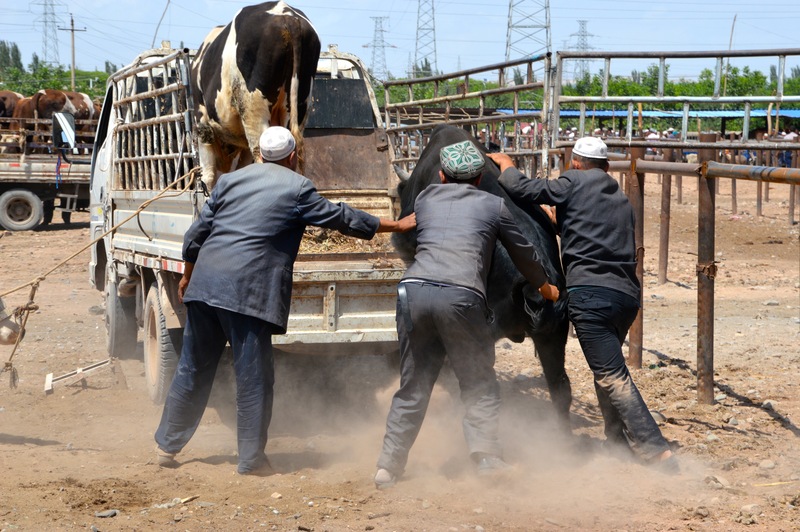 Lifting a cow into a ute at the Livestock market, Kashgar. 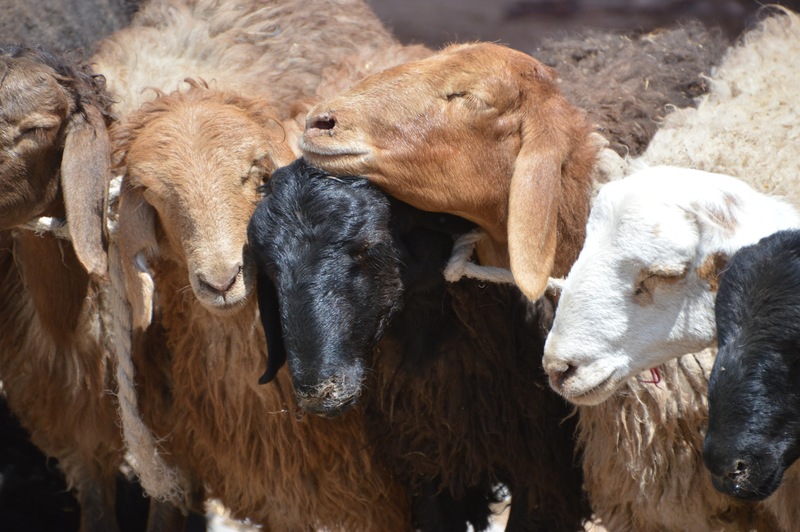 Fat bottom sheep. They exists.